Kevin: This is three potentially very good episodes that shmushed together become an adequate one. Let's work our way down the line. I like the idea of the Odo/Dax story and the holographic people. We've explored self-aware holograms with Moriarty. There's a philosophical question left largely unexplored that I think could have been fun. Is a family and community that looks, acts, and feels like a community less valid because it's programmed that way? I like that Odo comes to the defense of the community. It makes sense for the character in a way. He himself lives in a community he had to build because the one he was born into is lost to (ironically, and as yet un-revealed, because of the Dominion) I like the hinting that the Dominion are going to be the next Big Bad. I even like the schmaltzy moments between Taya and Odo. Like Data before him, the curious-about-humanity character ends up with a rapport with a small child, like Pen Pals or Thine Own Self. I liked the glimpse into his life an Party Favor Odo, and it made the top scene at the end really sweet. I would have just like a more direct engagement of the philosophical issue surrounding this community and maybe a little more freak-out by the colonists on the realization they are in fact a simulation. Like I said, it's all a good idea, and the Odo stuff keeps it grounded, but it falls short of stellar. Matthew: I'm pretty much uniformly pleased with what's here in the A plot for all the reasons you mention, but I agree that it's missing some major elements that really would have deepened the story. Was this guy a master programmer of AI? Was he insane or deranged at any point in this process? Did the villagers blithely accept their status because: 1. they had no choice in the matter, 2. they were programmed to, 3. they weren't complex enough to ask existential questions? Basically, this episode should have focused almost if not entirely on this plot. The mystery could have been drawn out a bit more, questions like those above could have been asked and answered, and even more exploration of the validity of sapient life regardless of origin could have been done. Kevin: The Jake story line is the biggest missed opportunity in the episode. Especially on a station full of non-Starfleet types, there's a great chance to see how the other 98% percent of the Federation and the other 99.999999999% of the rest of the galaxy lives. This was a great chance to expand how the actual life of the Federation works. We know Sisko's father is a chef and O'Brien almost became a cellist, so that's two jobs, right there. I would have liked to see some explanation of the role Starfleet plays or why everyone we've seen so far is so gung-ho on the organization. Maybe the huge resource investment to get to "Where No One Has Gone Before" provides a natural limit to the the best of the best. But what about the people who travel between known worlds or even never leave their world? There's got to be a life there, and I think seeing Jake explore those options could have been its own "slice-of-life" episode. I did really like the way the Sisko played the revelation. He is clearly supportive of his son and his choices, but is just the tiniest bit disappointed in a way he would obviously never make evident to Jake. It was a very honest parental moment. Matthew: I think the basic emotional story is sound, and it was clear that Jake did not share his father's dream. It's really a timeless story, when generations clash over expectations. But you're right that there are missed opportunities here. Well, are the really even missed, so much as postponed? We do return to this idea later on when Jake applies for the writing school. So I enjoy the basic idea of the scene in which Jake tells his dad that he can't meet his expectations, but it's very brief and feels rather unconnected to the A story. Kevin: The Bareil plot...I go back and forth. On the one hand, any credible depiction of a real, long term relationship is great, and I like that it builds slowly on the chemistry from the opening three-parter. The banter over springball is fun, and the scene when she kisses him and runs off as well the scene when she confronts Quark is pretty funny. Maybe it's because it's the third plot arc of the episode, it just feels a little rushed to me. I like Kira, and I like Bareil and not just because I think Philip Anglim is kind of a hottie, so I think this could have been better with more room to breathe. Matthew: I just don't know why this storyline is here at all. How is it related to the other stories at all? 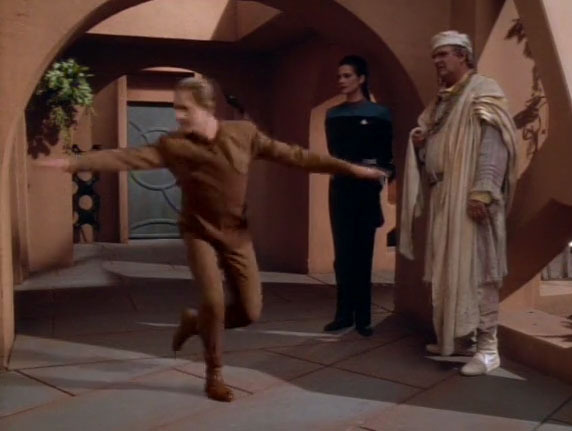 I could see an episode revolving around what happens when Odo is gone. This isn't it. The addition of Bareil to the mixture is totally out of left field. Kevin: Robert Hewitt Wolfe said he liked the episode since each plot had an element of something being not what it appears to be, the people are in fact holograms, the son of a Starfleet officer in fact doesn't want to go to Starfleet, and Bareil was not in fact just randomly on the station. I think that's really stretching in terms of finding a through line. That's like saying all the plots are joined because they all have conflict and resolution. Kevin: Kenneth Tobey was really good as Rurigan for me. He was crotchety and portrayed that distant, wounded thing well, without getting into Ira Graves territory. I bought his grief at the loss of his people. Noley Thornton, who previously played Clara Sutter in imaginary friends did a good job too, better I think than her last appearance. She had a good rapport with Odo, and I liked that it never veered into that odd place of child actor whose too grown up for their own good. Matthew: Yeah, Noley Thornton was excellent. She has a real clear, simple quality. So many child actors are always "Acting!" as opposed to just "being." And Tobey, as you say, was quite good, which is why it's a real shame the story didn't go deeper into his character's psyche. I would have loved to have seen some sort of deeper treatment, whether it was anger, unhinged, melancholy, whatever. Kevin: I like Anglim as Barreil. I thought he had a little more life this time, and I thought the chemistry with Kira was at least solid. I didn't want to slap Jake as I will on so many occasions over the course of the series, so there's that, and as always Colm Meany is a relatable, ruddy-faced little gem of an actor. Matthew: I agree that Anglim has graduated up from his previous moving-mannequin status. I think this was a good episode for both Terry Farrell and Cirroc Lofton. Dax has been kind of underutilized since the 3 parter, and here she gets to display a bit of range playing off Odo ad the holograms. Lofton portrayed inner conflict well. Is it the toughest job? No. But he did what he needed to do, and I think he should be recognized for it. Rene Auberjonois was typically good, moving easily between investigator and "friendly" roles. Kevin: The planet location set was good. I liked the architecture. I liked the wooden hair doodads, though at points they did remind me of those wooden bead mats drivers put on their car seats, but still, they looked nice. The costumes were visually interesting, a feat given all that white. There must not be a single bottle of ketchup in that whole village. Matthew: The shape shifting effect at the end was pretty good, I liked how Auberjonois sort of spun his arms and was morphed into the top. The disappearing effects for the holograms were also competent. They were mixed well with the Vazquez Rocks backdrop. Kevin: Beyond that, there wasn't much else in terms of effects work. I liked the holo-emmitter. It looked big and complex and durable, which would fit, given its job. Matthew: I thought the "reactor" was pretty neat looking. It had a kind of aesthetic where it was both art and technology, which was interesting. The village... I think the overall lines were neat, but I wondered where they got their food, what these people did with themselves all day, simulation or not. It seemed a bit small of a place to be a convincing domicile for 30 years. Kevin: None of the individual plots are great, but none of them are bad either. I think cutting it to two, even one, would have served the episode very well. Still, I am reasonably entertained and there's nothing bad here, so I am going with a 3. Matthew: An episode that focused only on the hologram story might have been a 4, or even a 5, done right. An episode with the A plot plus one of the other plots might have crept into 4 territory. But, overall, I agree. Each plot is weakened by their melding, but not past the point of being a solid show that keeps me entertained while it's on the screen. I agree with the 3, for a total of 6.